Another brutal ending this week for the stock market. The ECB had their meeting on Thursday and the Fed has their next release this coming Wednesday. 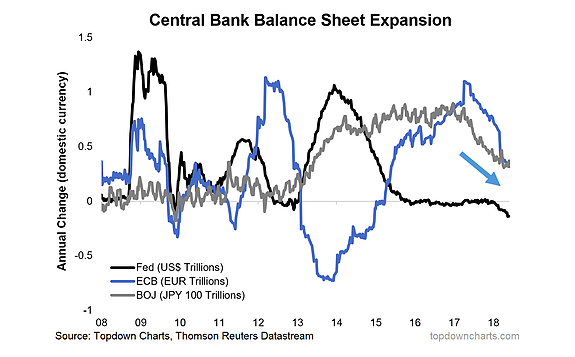 The central banks around the globe are converging on policy as they try and unwind their massive balance sheets accumulated over the last several years through their quantitative easing programs. The chart below shows that Japan, Europe and the U.S. central banks are stepping away from purchasing financial assets that amounts to about $100B monthly. 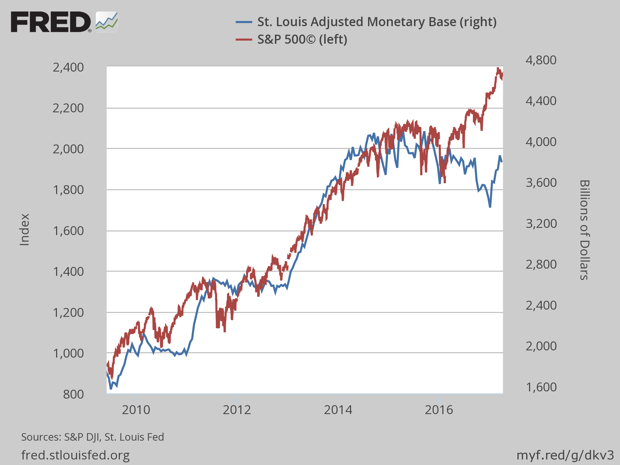 If we consider the expansion of the monetary base (caused by the Fed’s purchases) and the performance of the S&P 500 we can see that there has been a tight correlation in this relationship. You will notice that the two lines in the above chart diverge around the time of the 2016 election when a new tax bill began to be priced into the stock market. Now that the tax bill has largely been recognized, the relationship above will likely end up converging again which means that stocks are likely to move to the downside. How far does the Fed have until the size of their balance sheet is “normal”? The chart below gives you an idea of how much the Fed has grown their balance sheet since the pre-crisis days where they passively held around $600-$800B. The Fed has not given any guidance as to where they want to stop so we will just assume that is a tool they will use if the stock market gets too volatile. The stock market is showing signs of a breakdown as we have been unable to sustain any rallies since as we have been rangebound with the lower boundary of that range being tested on Friday. 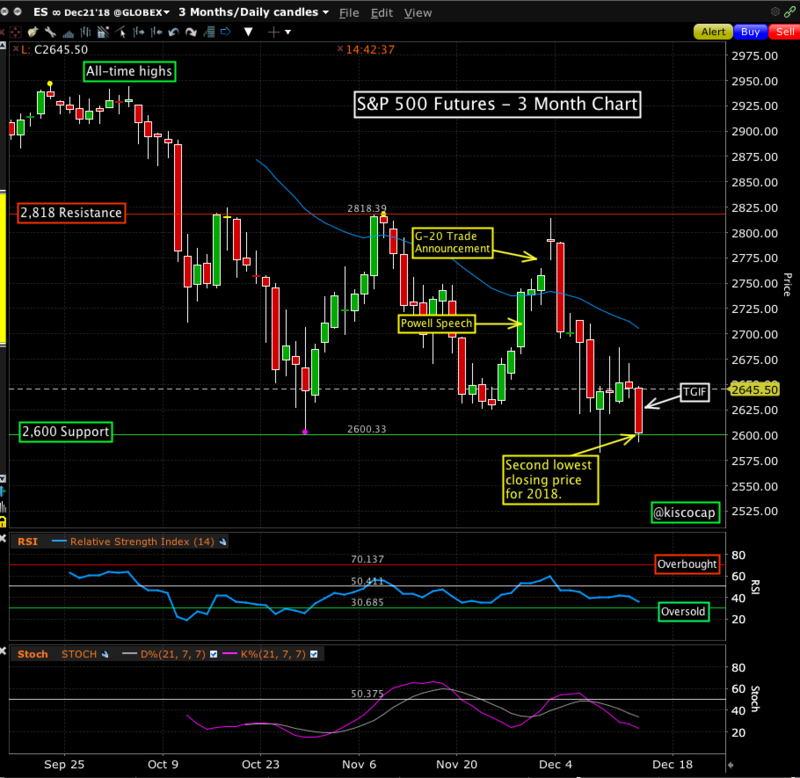 A break of the support level in the chart below on Monday would bring in more sellers to test the Fed on Wednesday. 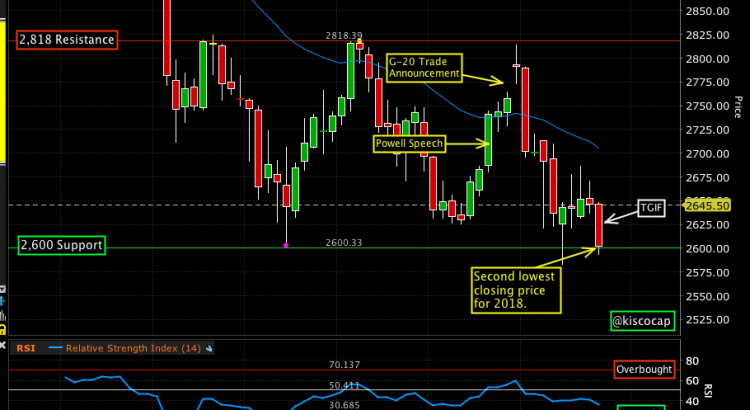 2,600 on the S&P futures. If we continue to move lower on Monday and close below this number then the technicals say we may be headed for much lower prices. The Fed. Release on 2PM Wednesday. They will likely raise interest rates 0.25%. However, what they say about the economy and the outlook for 2019 will be more important. Yield curve is still showing signs of inverting (3YR/5YR) so watch this relationship after the release and into the close on Friday. The health of the bond markets are in question as we potentially close the end of another business cycle. The leveraged loan sector has historically been seen as a safe place to earn interest with loans that have good underwriting and collateral. However, these standards have deteriorated in recent years as the Fed’s policies have forced investors to seek yield wherever possible. The price action below reflects that these bonds are being sold as concerns for an economic slowdown are beginning to be priced into even the “safest” of loan markets. 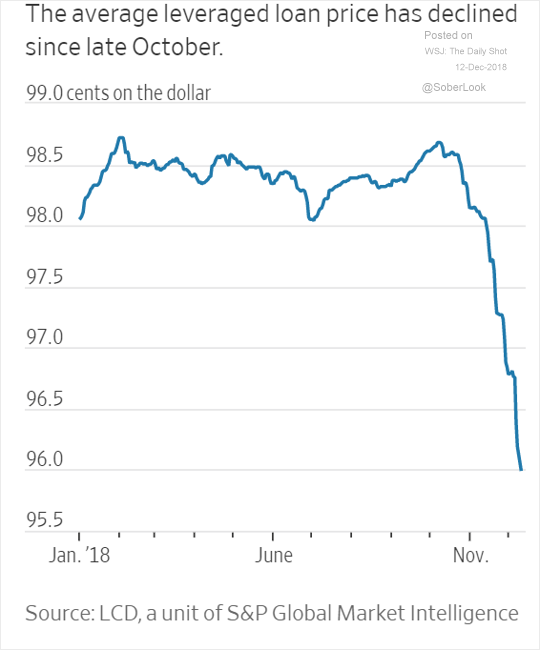 US inflation rose at its slowest pace in nine months for November as fuel and energy costs fell, in the latest sign that price pressures are easing after a surge earlier this year. Lower energy costs — thanks to a 22% slump in global crude prices — helped keep a lid on price gains last month.